Kick off your visit on the 13th (Wed): step into the grandiose world of Vajdahunyad Castle (Vajdahunyadvar), pause for some photo ops at Hősök tere, then boost your wellbeing at a local thermal spa, and finally get a sense of history and politics at Parliament. Get ready for a full day of sightseeing on the next day: take in the views from Szechenyi Chain Bridge, take in the spiritual surroundings of St. Stephen's Basilica (Szent Istvan Bazilika), see the interesting displays at House of Terror Museum, then steep yourself in history at Matthias Church, and finally steep yourself in history at Fisherman's Bastion. To find maps, other places to visit, photos, and more tourist information, you can read our Budapest day trip website . Sao Paulo, Brazil to Budapest is an approximately 18-hour flight. You can also do a combination of bus and flight. Traveling from Sao Paulo to Budapest, you'll lose 4 hours due to the time zone difference. Prepare for cooler weather when traveling from Sao Paulo in March: high temperatures in Budapest hover around 14°C and lows are around 1°C. Cap off your sightseeing on the 14th (Thu) early enough to travel to Krakow. Start off your visit on the 15th (Fri): have fun at Shooting in Krakow - Cracow Shooting Academy - Strzelnica Krakow, contemplate the long history of Wawel Cathedral, then admire the striking features of St. Mary's Basilica, then browse the different shops at Cloth Hall (Sukiennice), and finally don't miss a visit to Main Market Square. For where to stay, maps, other places to visit, and other tourist information, use the Krakow journey app . You can fly from Budapest to Krakow in 4.5 hours. Alternatively, you can drive; or take a bus. While traveling from Budapest, expect little chillier days and about the same nights in Krakow, ranging from highs of 9°C to lows of 0°C. Finish your sightseeing early on the 15th (Fri) to allow enough time to drive to Cesky Krumlov. Start off your visit on the 16th (Sat): contemplate the long history of Cesky Krumlov Castle, stroll through The Castle Garden, get to know the fascinating history of Historie mesta Ceský Krumlov, see the interesting displays at Moldavite Museum - Muzeum vltavinu, then steep yourself in history at Former Fink Cafe, and finally pause for some serene contemplation at Christi and Our Lady of Sorrows Church. 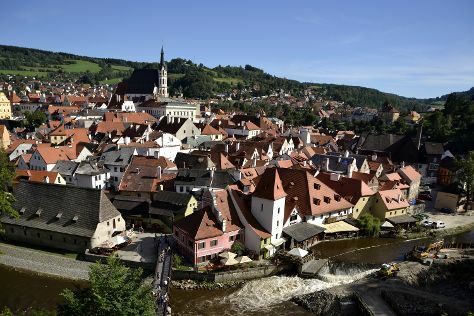 For more things to do, traveler tips, maps, and more tourist information, refer to the Cesky Krumlov trip planning tool . You can drive from Krakow to Cesky Krumlov in 6 hours. Alternatively, you can do a combination of flight, train, and bus; or do a combination of flight and train. Expect a daytime high around 12°C in March, and nighttime lows around 1°C. Cap off your sightseeing on the 16th (Sat) early enough to travel to Korcula Town. Start off your visit on the 17th (Sun): take in the exciting artwork at Bags by Kristina, don't miss a visit to Atelier Abel, make a trip to Korcula Old City, then shop like a local with Vapor gallery, then stop by Coral Shop Irena, and finally admire the landmark architecture of Revelin Tower. Here are some ideas for day two: see the interesting displays at Korcula Town Museum, take in the architecture and atmosphere at St. Mark's Cathedral, then learn about winemaking at Lovric Winery, and finally get outside with Freestyle. To see traveler tips, photos, other places to visit, and other tourist information, go to the Korcula Town day trip site . 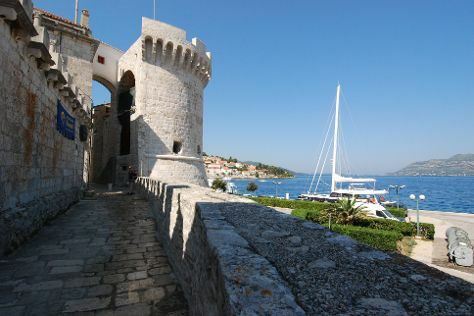 Use the Route module to find suitable travel options from Cesky Krumlov to Korcula Town. Traveling from Cesky Krumlov in March, expect Korcula Town to be somewhat warmer, temps between 19°C and 10°C. Finish up your sightseeing early on the 18th (Mon) so you can travel back home.